Lovely little story from the Launceston Examiner, 1851 (bottom left of page 5, so you’ll need to go on one from page 4), courtesy of Trove at the National Library of Australia. BUSHRANGING UNDER ARMS. – As a free man named John Cowley, who resides at Mrs. Stuart’s, opposite the Derwent Wine Vaults, Elizabeth street, was returning into town yesterday morning, he was attacked near to Mr. Edward Moore’s, at Stoney Point, about two miles on this side of Bridgewater, by two men, who rushed upon him, seized him by the neckerchief, and robbed him of about eleven pounds of butter, besides his hat. One of the party pulled the trigger of an old musket at Cowley, who had a rough-tussel with the man, described to be of a dark complexion, and about five feet and a half, in height. After robbing our traveller of his butter, the bushmen made off into the scrub, and Cowley instantly pursued his way to O’Brien’s Bridge to give information, when a detachment of armed police were sent in chase. The bushrangers had fastened one of their victims named Joln White to a tree, but he released himself after their departure. This circumstance occurred about nine o’clock yesterday morning, and information was lodged with the police by noon. -Ibid. 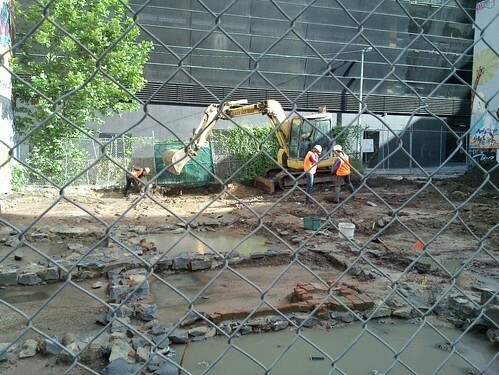 Anyone know anything about this archaeological dig in progress in Little La Trobe Street in Melbourne, just opposite the RMIT Uni Bookshop ? There’s no signage for it but they seem to be exposing the wall lines of old buildings in what was, until recently, a car park. 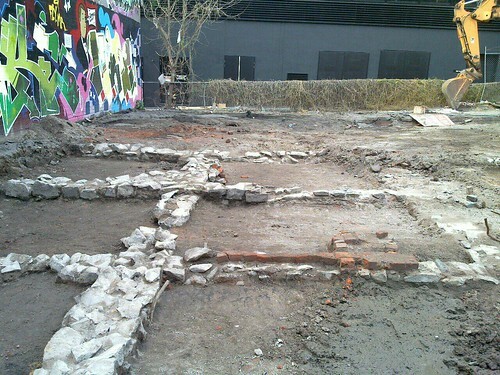 Update: Here’s the last photo I have before the rescue dig ended and they started clearing the site. Doesn’t sound very atheistic to me..
Neverthelesse, so ranke are they with grasse that it is a very comon speech among the Welsh, that the mountaines Eriry will yeeld sufficient pasture for all the cattaile in Wales, if they were put upon them together. Concerning the two Meare [lakes] on the toppe of these, in the one of which floteth a wandering Island, and in the other is found great store of fishes, but having all of them but one eye apeece, I will say nothing lest I might seeme to foster fables, although some, confident upon the authority of Giraldus, have beleeved it for a verity. the latter of which are said to be of so great an extent, that if all the herds in Wales were collected together, they would supply them with pasture for a considerable time. Upon them are two lakes, one of which has a floating island; and the other contains fish having only one eye, as we have related in our Itinerary. On the highest parts of these mountains are two lakes worthy of admiration. The one has a floating island in it, which is often driven from one side to the other by the force of the winds; and the shepherds behold with astonishment their cattle, whilst feeding, carried to the distant parts of the lake. A part of the bank naturally bound together by the roots of willows and other shrubs may have been broken off, and increased by the alluvion of the earth from the shore; and being continually agitated by the winds, which in so elevated a situation blow with great violence, it cannot reunite itself firmly with the banks. The other lake is noted for a wonderful and singular miracle. It contains three sorts of fish – eels, trout, and perch, all of which have only one eye, the left being wanting; but if the curious reader should demand of me the explanation of so extraordinary a circumstance, I cannot presume to satisfy him. So sadly it appears that William Camden was just referring back to a text that was almost 400 years old when the first edition of Britannia was published in 1586. From the Australian War Memorial uploads to the Flickr Commons project. 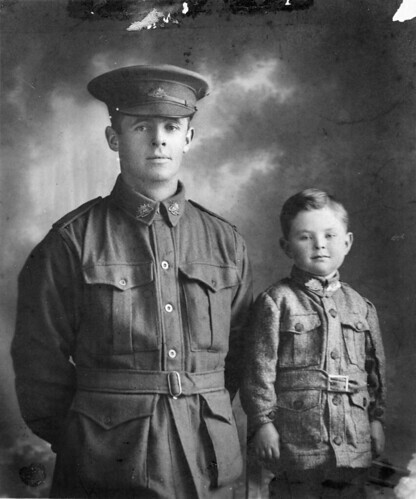 Studio portrait of 1626 Private (Pte) Walter Henry Chibnall, 10th Light Trench Mortar Battery, pictured with his son William Beresford (Billy) Chibnall. […] He was killed in action at Passchendaele, Belgium, on 12 October 1917, aged 32 […] Pte Billy Chibnall enlisted during the Second World War, serving with the 2/21st Battalion. He was taken prisoner of war and died, aged 30, on 20 February 1942 at Ambon. The ever fantastic “How to be a Retronaut” website has posted a brilliant collection of colour images of modern Leningrad which have been matched to, and partially overlaid with, black & white photos of the Siege of Leningrad during World War 2. The collection has been put together by Segei Larenkov.